For the last several years, our family has used two different kinds of natural salts: Redmond “Real Salt” and Celtic Sea Salt. Real Salt is the brand name of a salt that is harvested out of an ancient dried up sea bed in Utah. Real Salt contains no additives or chemicals, and it isn’t heat processed at all. Celtic Sea Salt is also a brand name. This salt is harvested from the ocean along the unpolluted coastline of Brittany, France, and dried naturally in the sun. Since both are unrefined salts, I had assumed that one was just as nourishing as the other. But as I was digging around the internet, looking for information, I found out that Celtic Sea Salt has a much higher mineral content than Real Salt. Being natural salts, both Celtic Sea Salt and Real Salt are infinitely better for your health than ordinary table salt, but in attempting to eat a nutrient rich diet, it makes sense to seek out the healthiest form of this everyday ingredient. If you’re like me, you may want to take a look at the mineral analysis chart here. 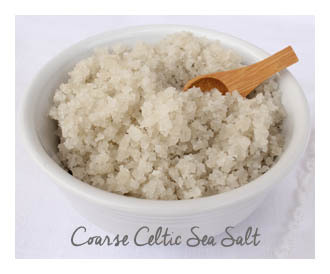 To order Celtic sea salt for local pick up, click here. 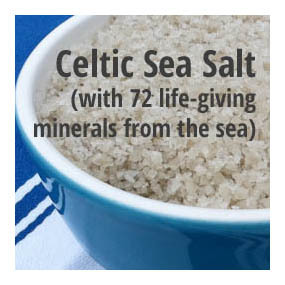 Order here to have your Celtic sea salt shipped. Salt is necessary for life. But just like refined sugar, table salt has been stripped of the very nutrients your body needs in order to use the salt itself. Instead of benefiting your body, table salt upsets the natural balance of fluids in your cells and actually dehydrates your body by pulling water out of the cells and tissues. That’s why you feel so thirsty after eating a salty meal. There is very little difference between ordinary table salt and most sea salts. Just because a salt originated in the sea doesn’t guarantee that processors haven’t stripped it of its nutrients, and unfortunately, most of them have. Refined sea salt is stark white, just like table salt, and it is almost entirely sodium chloride, nearly 99%, if not more. Be sure to look at your favorite salt’s package label. It shouldn’t be pure (or almost pure) sodium chloride. Instead, you should see a long list of minerals. Celtic Sea Salt is entirely an unrefined salt. It is made up of only 85% sodium chloride. The remaining 15% is made up of over 60 trace minerals. This is the same balance found in pure ocean water. Nothing has been added to Celtic Sea Salt, and nothing has been removed, well, except for the water which is evaporated naturally by the sun. Unrefined salt is always some kind of color, never stark white. Natural salts range from pinkish to gray, and some are actually blackish. The color depends on the type of minerals in the salt and their proportions. Celtic Sea Salt is light gray. Celtic Sea Salt is moist, too. The moisture actually locks in some of the minerals, so it’s best not to let this natural sea salt dry out. The flavor of Celtic Sea Salt is much better than the taste of refined salt. Much, much better. Instead of the chemical/salty flavor of refined salt, the taste of Celtic Salt is full and almost sweet. 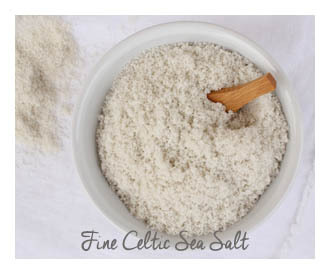 If you’ve checked the price, you probably noticed that coarse Celtic Sea Salt, otherwise known as “light gray” Celtic Salt, is nearly half the price of the fine ground Celtic Salt. We take advantage of this price difference and generally buy the coarse stuff. It’s easy to add to soups and almost any liquidy recipe. The only liquidy food I don’t add coarse salt to is gravy, because I’ve discovered that it doesn’t dissolve well in fatty liquids. One more reason to use the coarse Celtic Salt: it’s more moist than the fine ground version. Because moisture locks in some of the minerals, the coarse salt retains a slightly higher amount of minerals than fine ground Celtic Salt. Fine ground Celtic Salt is great: convenient, tasty, and excellent for your health. The only drawback is the higher price. But if you’re making the transition from regular table salt to sea salt, this is the salt I’d recommend since it’s most like the salt you’re used to. Give it a try! And don’t forget to stop back and let us know what you think of Celtic Sea Salt!